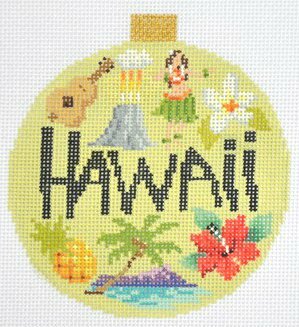 The design is handpainted onto 18 mesh mono Zweigart needlepoint canvas and measures 4" in diameter. You can purchase this needlepoint canvas with or without fibers. If you select cotton we will send DMC cotton floss or perle cotton. If you select wool we use Bella Lusso wool yarns; for silks we use Planet Earth Pepperpot Silks which are single ply for 18 mesh canvas. This canvas usually ships within 10 days. If there is likely to be a delay we will notify you. Feel free to contact us with any questions. We are always glad to help.